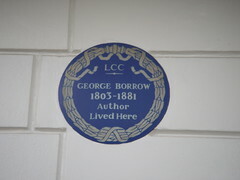 George Henry Borrow (5 July 1803 – 26 July 1881) was an English author who wrote novels and travelogues based on his experiences traveling around Europe. Over the course of his wanderings, he developed a close affinity with the Romani people of Europe, who figure prominently in his work. His best known books are The Bible in Spain, the autobiographical Lavengro, and The Romany Rye, about his time with the English Romanichal (gypsies). 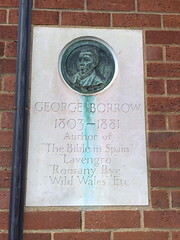 English author George Borrow 1803-1881 lived here between Dec. 1859-June 1860 Most famous books "The Bible In Spain" and "Lavengro"
Pied Bull. Originally named Bull Mansion, this was the residence of Chester's recorder in 1533. 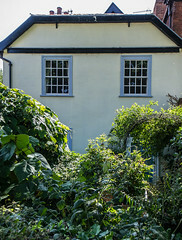 It was refronted in the 18th Century when it became an important coaching inn. 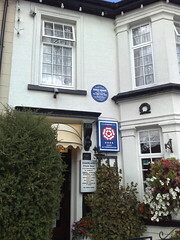 George Borrow is thought to have stayed here during his tour of "Wild Wales" in 1854.